You are currently browsing the Bookmobile News weblog archives for July, 2012. Well, ace book-drive coordinator Stacy Ruppert at United Way wanted to fill the bookmobile, and guess what? She did! The grand total from their book drive was 7,634 children’s books collected, plus 857 titles for adults. We are blessed with United Way’s partnership and thrilled to start giving these wonderful books away to lucky local kids…which we did this week, thanks to the fact that Stacy and her fellow staffers did such a great job sorting and boxing everything! Huge thanks go out to all the participants, especially Exchange Bank for hosting most of the book bins at their branches, and JDS Uniphase, Amy’s Kitchen, Target in Rohnert Park, and St. John’s Elementary School in Healdsburg for coordinating their own mini-drives to support the project. What a generous community we live in! Check out our major partners! 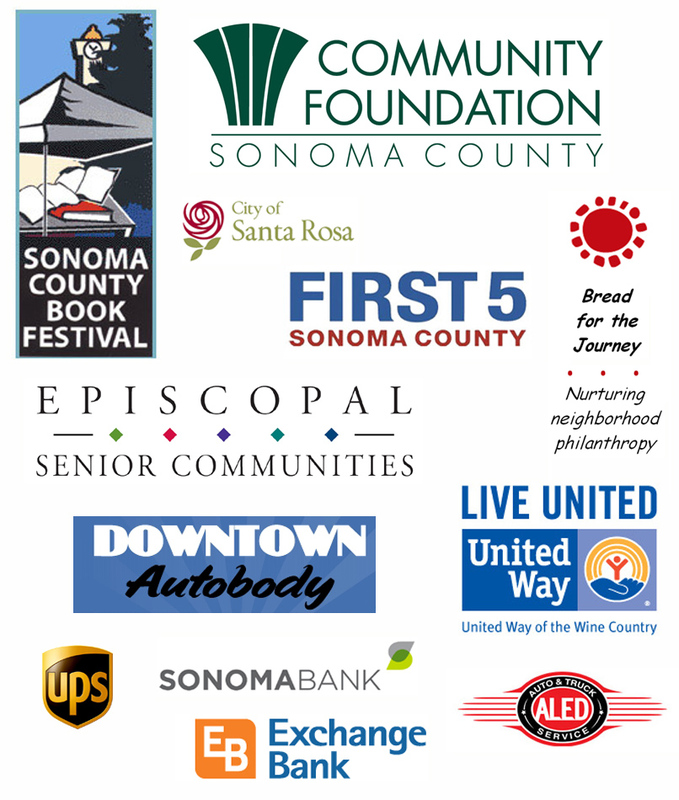 These folks care about literacy and strongly support our mission to bring books to those in need throughout Sonoma County. Please consider them when you do business – the full list with descriptions can be found on the Partners page of our website (http://freebookmobile.org/), or by clicking anywhere on the image below. If untangling terms like “organic” and “humanely raised” is a challenge, then Bruce Aidells’ The Great Meat Cookbook could be your savior. Join us at bucolic Windrush Farms in rural Petaluma as Bruce, inventor of the flying sausage, previews his book in conversation with Sonoma County’s own food maven Michele Anna Jordan. The event will raise crucial funds for this year’s Sonoma County Book Festival, a wonderful celebration of the literary arts to be held in September at Old Courthouse Square. In addition to the mouth-watering conversation, we will be sampling a variety of sausages (vegetarian dishes, too), as well as local wines and Lagunitas Beer. Tickets are on a sliding scale from $40 – 60, and children twelve and under are FREE! The event is Sunday, August 5 from 2 – 5 Pm at 2263 Chileno Valley Road, Petaluma. Please visit Brown Paper Tickets online or mail in your check by August 1 to PO Box 159, Santa Rosa, 95402. For more information, contact J.J. Wilson at boxcar@sonic.net or (707) 795-9028.